[Free Book] Double Your Profits... in just 10 minutes a day! - Coach & Grow R.I.C.H. [Free Book] Double Your Profits… in just 10 minutes a day! It sounds like a ginormous task, right? To double your profits in less than a year. All it takes is 10 minutes a day. 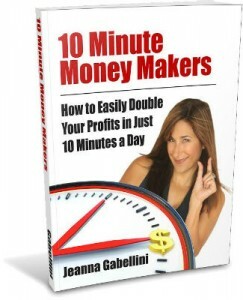 All you need to make it happen are some simple strategies that Jeanna Gabellini shares in her book, 10 Minute Money Makers: How to Easily Double Your Profits in Just 10 Minutes a Day. If you think it takes a ton of time, lots of hard work, boatloads of marketing strategy and thousands of dollars worth of coaching to double your profits, think again! Jeanna’s 10-minute money-makers are not only easy and quick, they’re fun! Go get your free copy right now! P.S. By the way, Jeanna Gabellini is a profit-doubling genius and master coach who has helped hundreds of business owners double and even triple their profits by doing a whole lot less and having a lot more fun. If anyone can show you how to have a blast while doubling your profits fast, it’s Jeanna.